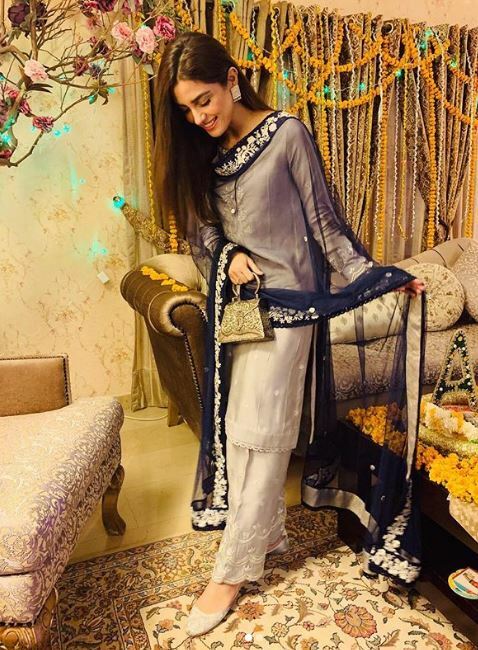 Once again, Maya Ali is back to dominating social media with her stunning looks at a recent family wedding. Her transformation has been talk of the town for some time now because she plays muse to designers who can’t seem to get enough of her. Hell, we can’t either. So, when Maya loaded the gram after her shoot with Faiza Saqlain for her Bridal Collection “Shehnai” , she went on to reign and nail more looks at a family wedding endorsing the brand and some other’s, BUT like a swan. Here our some of of Maya’s looks! Maya was sporting a customised plush pink velvet sleep wear because she was a part of the bride’s team, and also because it was the theme and our girl looked sassy! Minimal yet feminine, Maya looked very much the girl that every guy would want to take home and flaunt in front of his family! The beautiful silver white was a elegant shimmery affair paired with a royal blue chiffon dupatta with an embellished border. We loved the khussa! For the mayon, Maya was draped in a mustard yellow chiffon sari with gold lappa and red piping with her hair in a side sweep, and keeping it real before she rolled on to the next event. The PERFECT look for a day-nikkah at the magnanimous Badshahi Masjid. Another Faiza Saqlain jora that was a white outfit with silver kinri, kaam and pattiyan on it, bringing old-school grace back in the frame. 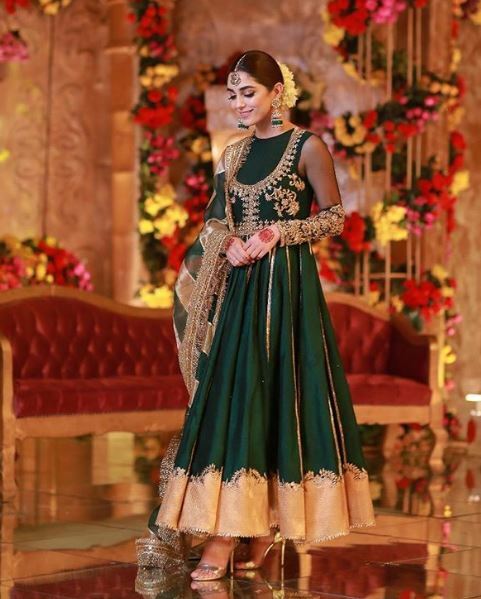 We’ve been seeing the trend of Pishwas back for casuals and formals with a lot of celebrities seen wearing them on different occasions but our favourite has to be this intense green and gold pishwas from Faiza Saqlain. From the hair to the gajra, Maya’s jewels and her mehndi as she swayed on the dance floor was one of the popular videos on Instagram. Whatever the event was, hands down, Maya was a pretty picture for the soar eyes. This festive pink was a burst of sparkle with detailing and style that was complimented with her flowing hair and earrings was a day look that we’re aiming for at our next family wedding.